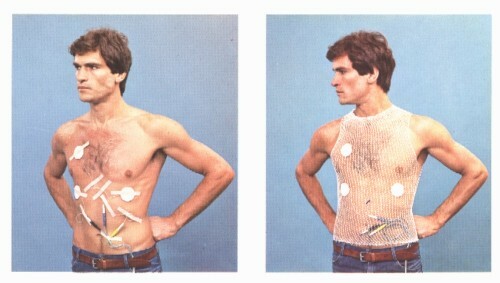 Stretch-net shirt keeps electrodes & lead wires in place, reduces baseline wandering. Left photo typical "Before", right photo "After"
Good ECG tracings demand that you minimize cable and wiring artifacts, see also our no. 16861 & 16862 stress test electrodes with locking tab for wire. This is a omnidirectional stretchable net shirt that softly and firmly secures electrodes and lead wires to the body of the patient during electrocardiogram. Cables do not move when the patient is running on the treadmill and electrodes stay in place even if they are loosened. This stress test shirt avoids hair cutting, taping or bandaging while it allows freedom of movement. It also avoids muscular tremors, jitters and baseline wandering.